We have two sectional football tickets available for tonight’s game for $6. Please see Jan Schrock in Athletics if you are interested. Reminder: Please do not chain your bikes to the fence along Purl St. by the soccer fields. If you do, it’s possible your lock will be cut off and your bike will be moved. It’s time to order your 2015-2016 school yearbook. The cost of the book is $45 until December, meaning the best time to buy is now! You can find order forms at the RedZone, in the main office, library and the guidance office. If you ordered before today, your name was entered in a drawing to win a free yearbook. 2nd place will receive $5 in RedZone bucks. The winners will be announced TODAY! IHSAA Student-Athlete Tip of the Week: Everyone that plays athletics at any level will suffer a tough loss from time to time. If you are a Michigan football player, last week’s loss to rival Michigan State is as tough as they come. Michigan’s punter fumbled the snap and MSU scored with no time left to win the game. Was it the punter’s fault? Was it a bad snap? Was it a coaching decision? In the long run, it doesn’t really matter. But one thing I do know is this: never let a play or game, good or bad, define you as a person. What really defines you is what you learn from your sport’s experience. Hopefully it makes you a better person and helps prepare you for future challenges in life! The Faith Mission in Elkhart is giving away coats for WOMEN & CHILDREN on Tuesday, November 3rd from 1-6:00 p.m. at 801 Benham Avenue. Each woman and child MUST be present to receive a coat. You may not pick up a coat for anyone who is not present. Please see flyers on bulletin boards throughout GHS for more information. Winter cheerleading and G-men tryouts will be on November 2nd and 3rd from 4-6:00 p.m. Meet in Whiteman gym on the mondo. You must have an up to date physical and a cardiac arrest and concussion paper turned into the athletic office to tryout. If you have any questions please contact Coach Sloan at kristy.sloan@goshenschools.org. Cafeteria News: There will be a menu change. This week will be manager’s choice! Boys basketball practice begins Monday, November 9th. All boys that plan to play must have a physical on file with the Athletic office. If you plan to play and are not currently in a fall sport you should be attending open gym/conditioning. See www.goshenbasketball.org (or see a coach) for the open gym schedule. GHS’s Month of Compassion Human Project has officially begun! Every year GHS students and staff bring in canned food items to be donated to local food pantries. This year, we will be collecting coats, hats and gloves in addition to non-perishable foods. Donation boxes are located in a limited number of classrooms throughout the school, and items will be accepted from now until November 19th. 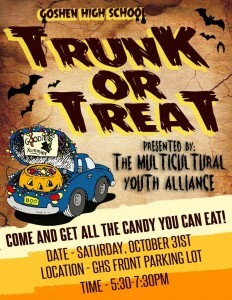 Attention Key Club members: We will be trick-or-treating for UNICEF on Halloween night from 5:30-7:30 p.m. If you have not yet picked up your collection box, please contact Mrs. Dillman right away. Money collected for UNICEF should be brought to our next Key Club meeting on Thursday, November 5th. Attention boys JV and varsity soccer players: Please make sure you stop by to see Coach Bjorkland or Coach Bontreger to pick up information and a permission slip regarding our end of the season banquet. It is important that you get the information TODAY! The Student Athletic Council will be meeting on Thursday, November 5th during the 2nd session of SRT in the main gym. This meeting is very important for information regarding GHS’s new Unified Track & Field team. All junior or senior student-athletes interested in helping with this program should attend this meeting. We will also be signing up for bell ringing for the holidays. Go Big Red! There will be an informational meeting in the main gym on November 10th during the 2nd session of SRT for all girls interested in playing tennis this spring. The boys varsity football team will play at Northrop High School at 7:30 p.m. vs. Ft. Wayne Snider. Take US 33 past Churubusco, turn left on Cook Rd. and go down about 4 miles. GO REDSKINS! Due to the change in the girls basketball scrimmage, boys basketball open gym will be from 3:45-6:00 p.m. tonight, not 6:30-8:30 p.m. as stated on the calendar. It’s time to order your 2015-2016 school yearbook. The cost of the book is $45 until December, meaning the best time to buy is now! You can find order forms at the RedZone, in the main office, library and the guidance office. Order before tomorrow and you can be entered in a drawing to win a free yearbook. 2nd place will receive $5 in RedZone bucks. We will announce the winners tomorrow! JAG is sponsoring a college visit field trip to IUSB on November 13th. This trip is open to Seniors and Juniors only. Permission slips are available in the Guidance Office and will be first come first serve. Space is limited, so either get on board today or get left behind! Do you want to scare your sweetheart? Frighten your friends? Treat them with a sweet Jambagram this week! National Honor Society will be selling Jambagrams TODAY during all lunches. Look for our table down by the Red Zone! Seniors – Ivy Tech will be here TODAY for an onsite admissions visit. Sign up in the guidance office and receive an admissions visit on the spot. GHS’s Month of Compassion Human Project has officially begun! Every year GHS students and staff bring in canned food items to be donated to local food pantries. This year, we will be collecting coats, hats and gloves in addition to non-perishable foods. Donation boxes are located in a limited number of classrooms throughout the school, and items will be accepted from now until November 19th. The class or team that has the most donations during SRT today will receive a Culver’s treat! The boys varsity football team will play tomorrow at Northrop High School at 7:30 p.m. vs. Ft. Wayne Snider. Take US 33 past Churubusco, turn left on Cook Rd. and go down about 4 miles. Reminder: Please do not chain your bikes to the fence along Purl St. by the soccer fields. It’s time to order your 2015-2016 school yearbook. The cost of the book is $45 until December, meaning the best time to buy is now! You can find order forms at the RedZone, in the main office, library and the guidance office. Order before Friday and you can be entered in a drawing to win a free yearbook. 2nd place will receive $5 in RedZone bucks. We will announce the winners on Friday! Do you want to scare your sweetheart? Frighten your friends? Treat them with a sweet Jambagram this week! National Honor Society will be selling Jambagrams during all lunches through tomorrow. Look for our table down by the Red Zone! Seniors – Ivy Tech will be here tomorrow for an onsite admissions visit. Sign up in the guidance office and receive an admissions visit on the spot. All boys tennis players need to sign up for a brief postseason meeting with the coaches. The sign-up sheet is on the locker room door and the meetings will take place in the locker room today. GHS’s Month of Compassion Human Project has officially begun! Every year GHS students and staff bring in canned food items to be donated to local food pantries. This year, we will be collecting coats, hats and gloves in addition to non-perishable foods. Donation boxes are located in a limited number of classrooms throughout the school, and items will be accepted from now until November 19th. The class or team that has the most donations during SRT tomorrow will receive a Culver’s treat! On Friday, the boys varsity football team will play at Northrop High School at 7:30 p.m. vs. Ft. Wayne Snider. Take US 33 past Churubusco, turn left on Cook Rd. and go down about 4 miles. The Crimsonaires will be presenting their Fall Preview Concert TONIGHT at 7:30 p.m. All tickets are $3 and will be available at the door. This will be a fun concert! This group of singer/dancers will perform standard pop, show tune and jazz. There will also be some great specially featured small groups. Plan now to enjoy this fun night! In celebration of Hispanic Heritage month the Center for Intercultural and International Education at Goshen College is proud to sponsor the chamber music theatre work Los Valientes, performed by Core Ensemble TONIGHT at 7:30 p.m. in Sauder Music Hall. The performance explores the artistic and political passions of Mexican painter Diego Rivera, the unwavering commitment to human rights of Salvadoran Archbishop Oscar Romero and the pursuit of social justice by Mexican American desperado Joaquin Murrieta, aka Zorro. This event is free and open to the public. Donations are appreciated. Do you want to scare your sweetheart? Frighten your friends? Treat them with a sweet Jambagram this week! National Honor Society will be selling Jambagrams during all lunches today-Thursday. Look for our table down by the Red Zone! Seniors – Ivy Tech will be here on Thursday for an onsite admissions visit. Sign up in the guidance office and receive an admissions visit on the spot. All boys tennis players need to sign up today for a brief postseason meeting with the coaches. The sign-up sheet is on the locker room door and the meetings will take place in the locker room today and tomorrow. This is the final call for anyone wishing to go to the play Harvey on Friday night at the Round Barn Theatre is Tuesday afterschool. Please get your $10 reservation to Mrs. Long in room 1400 no later than TODAY after school. The Crimsonaires will be presenting their Fall Preview Concert tomorrow at 7:30 p.m. All tickets are $3 and will be available at the door. This will be a fun concert! This group of singer/dancers will perform standard pop, show tune and jazz. There will also be some great specially featured small groups. Plan now to enjoy this fun night when you get back from Fall Break! In celebration of Hispanic Heritage month the Center for Intercultural and International Education at Goshen College is proud to sponsor the chamber music theatre work Los Valientes, performed by Core Ensemble tomorrow at 7:30 p.m. in Sauder Music Hall. The performance explores the artistic and political passions of Mexican painter Diego Rivera, the unwavering commitment to human rights of Salvadoran Archbishop Oscar Romero and the pursuit of social justice by Mexican American desperado Joaquin Murrieta, aka Zorro. This event is free and open to the public. Donations are appreciated. Congratulations to the Crimson Marching Band for qualifying for the ISSMA Semi-State! They will perform at 5:42 p.m. at Ben Davis High School this Saturday. The Crimson Marching Band placed 1st and was the overall Grand Champion at the Northrop Invitational this past weekend scoring the highest point total ever in school history. Way to go Crimson Marching Band and best of luck this weekend! Do you want to scare your sweetheart? Frighten your friends? Treat them with a sweet Jambagram this week! National Honor Society will be selling Jambagrams during all lunches tomorrow-Thursday. Look for our table down by the Red Zone! Congratulations to Hudson Kay, Luke Rush and Logan Troyer on being named All-District in tennis. Luke was also selected to the Northeast Senior All-Star team and Coach Love was District Coach of the Year. All boys tennis players need to sign up today for a brief postseason meeting with the coaches. The sign-up sheet is on the locker room door and the meetings will take place in the locker room tomorrow and Wednesday. The Goshen defense held Wawasee to just 64 total yards, as the boys varsity football team broke a four-game losing streak with a 20-0 victory over the Warriors. Jeff Stoll led Goshen with 24 carries for 123 yards and a 14-yard touchdown run. Quarterback C.J. Detweiler ran for a three-yard touchdown and also tossed a 17-yard scoring pass to Corbin Harrison. Goshen finishes the regular season at 5-4 and 3-4 in the Northern Lakes Conference, while Wawasee falls to 3-6 (1-6). The boys JV football team beat the Wawasee Warriors 49-21. Davis Hostetler had one TD pass, one rushing TD and one two point conversion. Tyrell Staton had 226 yards rushing and three rushing touchdowns. Josuel Sanchez had one touchdown reception. Austin Marlow had two rushing touchdowns. Thomas Heim had a fumble recovery. Ian Hostetler had two fumble recoveries. Tyler Brinson had one interception and five extra points. Sergio Cervantes had one interception. The girls JV volleyball team lost to Elkhart Memorial 0-2, lost to Plymouth 0-2 and lost to Warsaw 0-2. The boys cross country team advanced to Semi-State by placing 4th at Regionals. Juan Perez led the Goshen Harriers with his 4th place finish followed by Jason Barahona 10th, Felix Perez Diener 29th, Zach Oyer 43rd, Erik Villegas 44th, Diego Gutierrez 59th and Irving Suarez 60th. The girls cross country team ended their season at Regionals with an 8th place finish. Nora Rangel placed 22nd and qualified as an individual by being the 7th runner on a non advancing team. Kirsten Graves placed 41st, Annelise Wiebe 46th, Paola Rangel 48th, Brandi Smith 76th and Montse Reyes 85th. The 1 doubles pair of Luke Rush and Logan Troyer triumphed over Penn in the quarterfinal round of the State tournament by a score of 6-3, 6-2. They lost the first three games then came roaring back to win the next eight games and 12 of the last 14. The one doubles team of Luke Rush and Logan Troyer lost in the semifinals of the state tournament on Saturday to Fort Wayne Carroll by a score of 6-4, 6-4. They finished the season 26-2 and have been awarded the honor of 2nd team All-State. Mr. Gonzalez’s 5th period class will take A lunch today. It’s School Lunch Appreciation Week! If you get a chance, please say thank you to our wonderful cafeteria staff. We appreciate all they do for the students and staff here at GHS! The Goshen Public Library doesn’t just lend books! We also offer FREE activities for young adults. Stop in on Thursdays after school from 4-6:00 p.m. to hang out, study, find an independent reading book, play a board game, color or just chillax at the teen café! And, of course, we’ll also have hot chocolate and coffee. Looking for something to do tomorrow night? At Nerd’s Night Out, bring your friends to the Leaky Cauldron for a Harry Potter-themed party and tournament from 5-8:00 p.m. There will be food for all and prizes for the winners! Finally, our regular programming will conclude this month with the Crafty Bandits on Monday, October 26th from 4-6:00 p.m. where we’ll have snacks and decorate mugs. To sign up, or for more information about our programs, stop by the library or check out our website, Facebook or Twitter. Do you have plans for Fall Break? The Goshen Public Library does! If you’re in 6th-12th grades, we’re having programs Monday-Thursday for you from 2-5:00 p.m. during Teen Read Week based on a travel theme. Monday we’ll have an International Iron Chef cooking and menu design competition; Tuesday is Ticket to Read with a travel-themed board game, scavenger hunt and art activity; Wednesday is all about time travel with a Back to the Future Day and an interactive viewing of the classic movie; and Thursday we’ll learn about biomes around the world with a nature walk, terrarium building, and an art project. Sign up yourself and a friend today for fun and snacks at the library over Fall Break! Goshen girls basketball tryouts begin next week. Anyone who wants to tryout must have all paperwork on file in the athletic office and be present for all three tryout sessions. Tryout sessions take place on Monday from 11:00 a.m.-12:30 p.m., then again from 4:30-6:30 p.m. and on Tuesday from 4:00-6:00 p.m. in the main gym. Practices will continue over fall break so please plan accordingly. If you need a schedule please see Mr. Krebs or Mr. Carpenter. Mr. Krebs has basketball shoes you can try on in his room. If you plan to play basketball, please stop by his room and try on shoes. IHSAA Student-Athlete Tip of the Week: Whether you are a starter for your team or a bench player (substitute), then it’s your responsibility to stay focused and ready when you are not in the game. The Colts Andrew Luck did not play the last two games, but was still engaged on the sidelines, even getting water for his teammates. He knew he wasn’t playing, but did all that he could to contribute to his team. Are you a positive influence on your team when you aren’t playing? Are you doing everything off the field (court) to help your team to a victory? Successful teams see enthusiasm from everyone! The guidance office has just received the Abbott & Fenner general scholarship. Please stop by for more information. Drama club officers are Grace Bickel, Nathan Berkey, Zoe Brown and Jonathan Bontrager-Waite. Please see any of the officers or Mrs. Long if you wish to see Harvey at the Round Barn Theatre on October 30th. Your $10 deposit and reservation need to be turned in by TODAY. The Crimsonaires will be presenting their Fall Preview Concert on Tuesday, October 27th at 7:30 p.m. All tickets are $3 and will be available at the door. This will be a fun concert! This group of singer/dancers will perform standard pop, show tune and jazz. There will also be some great specially featured small groups. Plan now to enjoy this fun night when you get back from Fall Break! Today’s theme is Black-Out! Bring your game faces and black shirts, pants and jackets to the game for Senior Night! In celebration of Hispanic Heritage month the Center for Intercultural and International Education at Goshen College is proud to sponsor the chamber music theatre work Los Valientes, performed by Core Ensemble on Tuesday, October 27th at 7:30 p.m. in Sauder Music Hall. The performance explores the artistic and political passions of Mexican painter Diego Rivera, the unwavering commitment to human rights of Salvadoran Archbishop Oscar Romero and the pursuit of social justice by Mexican American desperado Joaquin Murrieta, aka Zorro. This event is free and open to the public. Donations are appreciated. The GHS Chess Club will begin meeting after fall break. Anyone interested in joining chess club may contact Mr. Cross in room 1070, or email: kcross@goshenschools.org. JAG is sponsoring a college visit field trip to IUSB on November 13th. This trip is open to Seniors and Juniors only. Permission slips are available in the Guidance Office starting today and will be first come first serve. Space is limited, so either get on board today or get left behind! Do you want to scare your sweetheart? Frighten your friends? Treat them with a sweet Jambagram the week after fall break! National Honor Society will be selling Jambagrams during all lunches on Tuesday, Wednesday and Thursday after fall break. Look for our table down by the Red Zone! Congratulations to Hudson Kay, Luke Rush and Logan Troyer on being named All-District in tennis. Luke was also selected to the Northeast Senior All-Star team and Coach Love was District Coach of the Year. Good luck to Luke and Logan next weekend at the state tennis tournament! Girls varsity volleyball was ahead 13-8 in the first game when the lights in the gym went out. Teams waited for about an hour and the lights did not come back on so the game was cancelled. The girls JV volleyball team defeated West Noble 2-0. The boys varsity football team will host Wawasee at 7:00 p.m. The girls JV volleyball team will compete in the Memorial JV Tourney at 9:00 a.m. The boys and girls varsity cross country team will compete in Regionals at 10:00 a.m. at Ox Bow. The boys JV football team will play at Wawasee at 10:00 a.m.
Today is the deadline for IB registration forms. Please turn them in to Mrs. Haney by the end of the day. There will be a Swimming and Diving call-out meeting TODAY in the cafeteria from 3:45-4:30 p.m. If you have any questions please email Coach Long at nlong@goshenschools.org. The Goshen Public Library doesn’t just lend books! We also offer FREE activities for young adults. Stop in on Thursdays after school from 4-6:00 p.m. to hang out, study, find an independent reading book, play a board game, color or just chillax at the teen café! And, of course, we’ll also have hot chocolate and coffee. Today is our Pages & Popcorn Club from 5:30-8:00 p.m. We’ll talk about the books Cinder and Bound–both based on the Cinderella story–and watch the new live-action version of the movie. You can still sign up to get a free copy of the book! Looking for something to do tomorrow night? At Nerd’s Night Out, bring your friends to the Leaky Cauldron for a Harry Potter-themed party and tournament from 5-8:00 p.m. There will be food for all and prizes for the winners! Finally, our regular programming will conclude this month with the Crafty Bandits on Monday, October 26th from 4-6:00 p.m. where we’ll have snacks and decorate mugs. To sign up, or for more information about our programs, stop by the library or check out our website, Facebook or Twitter. Drama club officers are Grace Bickel, Nathan Berkey, Zoe Brown and Jonathan Bontrager-Waite. Please see any of the officers or Mrs. Long if you wish to see Harvey at the Round Barn Theatre on October 30th. Your $10 deposit and reservation need to be turned in by TOMORROW. Tomorrow’s theme is Black-Out! Bring your game faces and black shirts, pants and jackets to the game for Senior Night! Student Council will be hosting a bonfire for Senior Night! Come out tonight to the football field from 9:00-10:00 p.m.
All new Stay In Bounds Ambassadors need to attend training meetings during the 2nd session of SRT today in the main gym. All returning ambassadors need to make this meeting if they did not go on Tuesday. 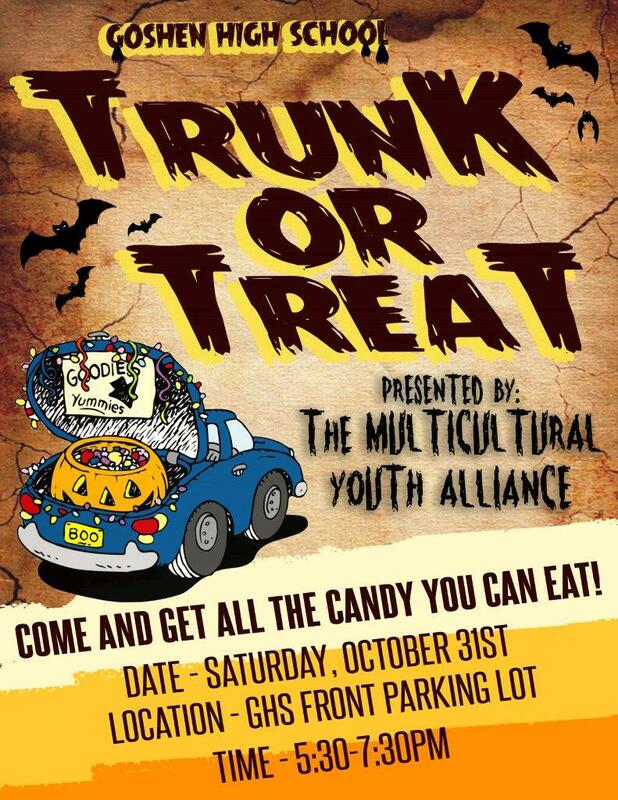 Attention: Multicultural Youth Alliance members – Plan to meet today during the 2nd session of SRT in Whiteman Gym. The boys freshman football team plays at Plymouth at 6:00 p.m. The girls JV and varsity volleyball teams will play at West Noble. JV starts at 6:00 p.m., followed by varsity at 7:30 p.m. If you’re taking an IB exam this year, you must turn in a registration form to Mrs. Haney by TOMORROW. If you don’t turn in your form this week, you place yourself in jeopardy of not begin able to test. Paying in full is not required when you turn in the form. If you have questions, please ask Mr. Nichols in 2360 or Mrs. Collins in the library. Honey’s Supports Goshen High School! Please visit Honey’s TODAY anytime between 7:00 a.m.-10:00 p.m. They will donate 20% of your purchase to GHS when you present a coupon at check out. Coupons are located in the main office and in Guidance. There will be a Swimming and Diving call-out meeting tomorrow in the cafeteria from 3:45-4:30 p.m. If you have any questions please email Coach Long at nlong@goshenschools.org. The Goshen Public Library doesn’t just lend books! We also offer FREE activities for young adults. Stop in on Thursdays after school from 4-6:00 p.m. to hang out, study, find an independent reading book, play a board game, color or just chillax at the teen café! And, of course, we’ll also have hot chocolate and coffee. Tomorrow is our Pages & Popcorn Club from 5:30-8:00 p.m. We’ll talk about the books Cinder and Bound–both based on the Cinderella story–and watch the new live-action version of the movie. You can still sign up to get a free copy of the book! Looking for something to do on Friday night? At Nerd’s Night Out, bring your friends to the Leaky Cauldron for a Harry Potter-themed party and tournament from 5-8:00 p.m. There will be food for all and prizes for the winners! Finally, our regular programming will conclude this month with the Crafty Bandits on Monday, October 26th from 4-6:00 p.m. where we’ll have snacks and decorate mugs. To sign up, or for more information about our programs, stop by the library or check out our website, Facebook or Twitter. Got plans for Fall Break? The Goshen Public Library does! If you’re in 6th-12th grades, we’re having programs Monday-Thursday for you from 2-5:00 p.m. during Teen Read Week based on a travel theme. Monday we’ll have an International Iron Chef cooking and menu design competition; Tuesday is Ticket to Read with a travel-themed board game, scavenger hunt and art activity; Wednesday is all about time travel with a Back to the Future Day and an interactive viewing of the classic movie; and Thursday we’ll learn about biomes around the world with a nature walk, terrarium building, and an art project. Sign up yourself and a friend today for fun and snacks at the library over Fall Break! Goshen girls basketball tryouts begin the week of October 19th. Anyone who wants to tryout must have all paperwork on file in the athletic office and be present for all three tryout sessions. Tryout sessions take place on Monday, October 19th from 11:00 a.m.-12:30 p.m., then again from 4:30-6:30 p.m. and on Tuesday, October 20th from 4:00-6:00 p.m. in the main gym. Practices will continue over fall break so please plan accordingly. If you need a schedule please see Mr. Krebs or Mr. Carpenter. Mr. Krebs has basketball shoes you can try on in his room. If you plan to play basketball, please stop by his room and try on shoes. Drama club officers are Grace Bickel, Nathan Berkey, Zoe Brown and Jonathan Bontrager-Waite. Please see any of the officers or Mrs. Long if you wish to see Harvey at the Round Barn Theatre on October 30th. Your $10 deposit and reservation need to be turned in by this Friday. If you are signed up to go on the Ancilla College visit tomorrow you will be leaving from the circle drive at 8:30 a.m. You do not need to report to your 2nd period class. The final list of who is going is posted on the door to 1180, 8050 and Guidance. This Friday’s theme is Black-Out! Bring your game faces and black shirts, pants and jackets to the game for Senior Night! Student Council will be hosting a bonfire for Senior Night! Come out tomorrow to the football field from 9:00-10:00 p.m.
All new Stay In Bounds Ambassadors need to attend training meetings during the 2nd session of SRT tomorrow in the main gym. All returning ambassadors need to make this meeting if they did not go on Tuesday. The girls C volleyball team lost to Jimtown 0-2. The JV girls volleyball team defeated Jimtown 2-0. The varsity girls volleyball team lost to Jimtown 3-2. The Girls Soccer Regional game will be held at Goshen High School with the first game of Penn vs. Culver Academy beginning at 5:30 p.m. The second game of Northridge vs. South Bend St. Joseph is scheduled for 7:30 p.m. Gates will open at 4:30 p.m. and admission will be $6.00 (single game) or $9.00 (all tournament) for kindergarten through adult. IB registrations forms are due on Thursday. Please turn them in to Mrs. Haney in the main office. Although you can pay in full when you turn in the form, this is not required. If you have questions, see Mr. Nichols in 2360 or Mrs. Collins in the library. Honey’s Supports Goshen High School! Please visit Honey’s on Wednesday. Honey’s will donate 20% of your purchase to GHS when you present a coupon at check out. Coupons are located in the main office and in Guidance. JAG is sponsoring a trip to Ancilla College on Thursday for juniors and seniors. Lunch and transportation will be provided. The permission slip can be picked up from Ms. Hollinger in Guidance and they are due TODAY. It is first come first serve, and there are limited spots available, so don’t delay! IUSB will be here tomorrow for an on-site admissions visit. Your application fee will be waved, you may qualify for a $500 scholarship and you will receive an admissions decision on the spot. Please sign up in the guidance office. There will be a Swimming and Diving call-out meeting on Thursday in the cafeteria from 3:45-4:30 p.m. If you have any questions please email Coach Long at nlong@goshenschools.org. The Goshen Public Library doesn’t just lend books! We also offer FREE activities for young adults. Stop in on Thursdays after school from 4-6:00 p.m. to hang out, study, find an independent reading book, play a board game, color or just chillax at the teen café! And, of course, we’ll also have hot chocolate and coffee. Thursday is our Pages & Popcorn Club from 5:30-8:00 p.m. We’ll talk about the books Cinder and Bound–both based on the Cinderella story–and watch the new live-action version of the movie. You can still sign up to get a free copy of the book! Looking for something to do on Friday night? At Nerd’s Night Out, bring your friends to the Leaky Cauldron for a Harry Potter-themed party and tournament from 5-8:00 p.m. There will be food for all and prizes for the winners! Finally, our regular programming will conclude this month with the Crafty Bandits on Monday, October 26th from 4-6:00 p.m. where we’ll have snacks and decorate mugs. To sign up, or for more information about our programs, stop by the library or check out our website, Facebook or Twitter. SENIORS: Please check your school Gmail for information on college presentations being given in the Auditorium on PSAT day (Wednesday) from 8:25-9:50 a.m. IUPUI and Southwestern Michigan College will be here to provide info on all that they have to offer. You must register in advance through any teacher or the Guidance Office. The deadline for registering is tomorrow at 1:00 p.m. Check it out today!! All girls soccer players have a mandatory end of the season meeting after school today in the teachers’ lounge by the cafeteria. Players will be voting on team awards, completing a survey and turning in their warm-ups, bags and locks. Varsity and JV boys soccer players – This is a reminder that you need to pick up your pizza kit for the fundraiser today at 5:00 p.m. in the cafeteria. It is important that you are there with your transportation. If you have any questions see Coach Bontreger, Coach Bjorkland or Coach Emery. Drama club will meet tomorrow after school in the auditorium at 4:00 p.m. There will be a call out meeting tomorrow for anyone (including GMEN) that is interested in winter cheerleading (basketball season) during the 2nd session of SRT on the upper deck in the main gym. If you are unable to attend the meeting please contact Coach Sloan. There will be a meeting tomorrow during the 2nd session of SRT for all students interested in the marine biology trip this coming spring break. The meeting will be held in room 3050. If you have an interest please plan to attend this meeting. Zip-lining in Costa Rica anyone? Any student interested in studying abroad in Costa Rica next summer should come to a meeting during the 2nd session of SRT tomorrow. Students studying Spanish have an opportunity to immerse themselves living with a host family and exploring three different parts of Costa Rica. Come learn more on Tuesday with Mr. Gonzalez in room 2440. All new Stay In Bounds Ambassadors need to attend training meetings during the 2nd session of SRT tomorrow and Thursday in the main gym this week. All returning ambassadors are to make one of these meetings. The girl’s cross country team placed 4th at Sectionals. Nora Rangel was Goshen’s top finisher in 12th followed by Kirsten Graves 18th, Annelise Wiebe 25th, Paola Rangel 30th, Ariana Perez Diener 31st, Montse Reyes 51st and Brandi Smith 56th. The Girls will compete Saturday at the Regional meet. The boys cross country team were runner ups at the Elkhart sectional. Goshen’s top finisher was Juan Perez in 2nd place followed by Jason Barahona 5th, Felix Perez Diener 11th, Zach Oyer 29th, Erik Villegas 30th, Irving Suarez 35th and Angel Arrelo 45th. The Boys will compete Saturday at Regionals. The boys tennis team lost in Semi-State Saturday to 11th ranked Fort Wayne Leo by a score of 4-1. However, their season is not over as Luke Rush and Logan Troyer advanced at the 1 doubles position and will compete in the state tournament in two weeks. Good luck at State Luke and Logan! The girls C volleyball team lost to Concord 25-9, lost to Northwood 25-14 and lost to Plymouth 25-13. The boys JV football team defeated Plymouth 44-14. Tyrell Staton had 150 yards rushing and three rushing touchdowns. Davis Hostetler had two passing touchdowns and one rushing touchdown. Brandon Holley had two receiving touchdowns. Joseph Burkheimer had one interception. Tyler Brinson had one interception. The girls JV volleyball team lost to South Bend Adams 2-0 and defeated Jimtown 2-0. The boys varsity football team lost to Plymouth 31-17. Lost & Found: If you have misplaced something please consider checking in the lost and found located at the Welcome Center. Lost IDs are also located there. Items are piling up quickly! If you’ve lost a phone, jewelry or glasses please see Mrs. Stealy in the main office. JAG is sponsoring a trip to Ancilla College on Thursday for juniors and seniors. Lunch and transportation will be provided. The permission slip can be picked up from Ms. Hollinger in Guidance and returned to her when it’s signed. It is first come first serve, and there are limited spots available, so don’t delay! The GHS Fall play (Anne of Green Gables) will be presented at the Downtown Goshen Theatre. Show times are: Tonight at 7:30 p.m. and tomorrow at 2:00 p.m. The cost is $5 for students and $7 for non-students. IUSB will be here on Tuesday for an on-site admissions visit. Your application fee will be waved, you may qualify for a $500 scholarship and you will receive an admissions decision on the spot. Please sign up in the guidance office. The GHS Spell Bowl team needs more members! Any and all students are welcome to be a part of Spell Bowl. Please see or email Ms. Lisa Caskey in room 3130 for details. The guidance office has received the NFIB Young Entrepreneur Foundation Scholarship. Please stop in for more information. Today’s theme is superhero! Show us your fabulous capes and hero outfits! Key Club members: The Fall Rally and Lock-In is tomorrow at 7:00 p.m. The cost is $10 at the door, and you must register online before tomorrow. Email Mrs. Dillman if you have any questions. IHSAA Student-Athlete Tip of the Week: What traits do you possess that set you apart from the other athletes in your sport? Do you give much thought about the little things that could make a big difference in your performance and playing time? Too many times young athletes get caught up in the physical portion of their sport, forgetting about the importance of a good mental approach as well. Setting yourself apart from others mentally might be the key for more success and more playing time. So concentrate on playing smarter by limiting your turnovers (regardless of your sport), and do away with foolish mistakes and mental errors. While no one is perfect, making fewer mistakes because of your mental toughness will give your coach the confidence to count on you when the going gets tough! The Goshen Public Library doesn’t just lend books! We also offer FREE activities for young adults. Stop in on Thursdays after school from 4-6:00 p.m. to hang out, study, find an independent reading book, play a board game, color or just chillax at the teen café! And, of course, we’ll also have hot chocolate and coffee. Thursday is our Pages & Popcorn Club from 5:30-8:00 p.m. We’ll talk about the books Cinder and Bound–both based on the Cinderella story–and watch the new live-action version of the movie. You can still sign up to get a free copy of the book! Looking for something to do next Friday night? At Nerd’s Night Out on October 16th, bring your friends to the Leaky Cauldron for a Harry Potter-themed party and tournament from 5-8:00 p.m. There will be food for all and prizes for the winners! Finally, our regular programming will conclude this month with the Crafty Bandits on Monday, October 26th from 4-6:00 p.m. where we’ll have snacks and decorate mugs. To sign up, or for more information about our programs, stop by the library or check out our website, Facebook or Twitter. SENIORS: Please check your school Gmail for information on college presentations being given in the Auditorium on PSAT day (Wednesday) from 8:25-9:50 a.m. IUPUI and Southwestern Michigan College will be here to provide info on all that they have to offer. You must register in advance through any teacher or the Guidance Office. The deadline for registering is Tuesday at 1:00 p.m. Check it out today!! All girls soccer players have a mandatory end of the season meeting on Monday after school in the teachers’ lounge by the cafeteria. Players will be voting on team awards, completing a survey and turning in their warm-ups, bags and locks. There will be a call out meeting on Tuesday for anyone (including GMEN) that is interested in winter cheerleading (basketball season) during the 2nd session of SRT on the upper deck in the main gym. If you are unable to attend the meeting please contact Coach Sloan. There will be a meeting Tuesday during the 2nd session of SRT for all students interested in the marine biology trip this coming spring break. The meeting will be held in room 3050. If you have an interest please plan to attend this meeting. Zip-lining in Costa Rica anyone? Any student interested in studying abroad in Costa Rica next summer should come to a meeting during the 2nd session of SRT on Tuesday. Students studying Spanish have an opportunity to immerse themselves living with a host family and exploring three different parts of Costa Rica. Come learn more on Tuesday with Mr. Gonzalez in room 2440. The boys varsity football team will play at Plymouth at 7:00 p.m. Go Redskins! The boys varsity tennis team will compete in Semi State at Homestead at 12:00 p.m. The girls JV volleyball team will host the Goshen Invitational at 9:00 a.m. The girls freshman volleyball team will compete in the Plymouth Invitational at 9:00 a.m. The boys JV football team will host Plymouth at 10:00 a.m. The boys and girls varsity cross country team will compete in Sectionals at Ox Bow Park at 10:00 a.m. REMINDER: Parent/Teacher Conferences are tonight from 4-8:00 p.m. in the cafeteria and commons area. IB registrations forms are due on October 15th. Please turn them in to Mrs. Haney in the main office. Although you can pay in full when you turn in the form, this is not required. If you have questions, see Mr. Nichols in 2360 or Mrs. Collins in the library. The GHS Fall play (Anne of Green Gables) will be presented at the Downtown Goshen Theatre. Show times are: Friday at 7:30 p.m. and Saturday at 2:00 p.m. The cost is $5 for students and $7 for non-students. There will be a Swimming and Diving call-out meeting on Thursday, October 15th in the cafeteria from 3:45-4:30 p.m. If you have any questions please email Coach Long at nlong@goshenschools.org. Friday’s theme is superhero! Show us your fabulous capes and hero outfits! Key Club members: The Fall Rally and Lock-In is this Saturday at 7:00 p.m. The cost is $10 at the door, and you must register online before Saturday. Email Mrs. Dillman if you have any questions. The Goshen Public Library doesn’t just lend books! We also offer FREE activities for young adults. Stop in on Thursdays after school from 4-6:00 p.m. to hang out, study, find an independent reading book, play a board game, color or just chillax at the teen café! And, of course, we’ll also have hot chocolate and coffee. Thursday, October 15th is our Pages & Popcorn Club from 5:30-8:00 p.m. We’ll talk about the books Cinder and Bound–both based on the Cinderella story–and watch the new live-action version of the movie. You can still sign up to get a free copy of the book! Looking for something to do on a Friday night? At Nerd’s Night Out on October 16th, bring your friends to the Leaky Cauldron for a Harry Potter-themed party and tournament from 5-8:00 p.m. There will be food for all and prizes for the winners! Finally, our regular programming will conclude this month with the Crafty Bandits on Monday, October 26th from 4-6:00 p.m. where we’ll have snacks and decorate mugs. To sign up, or for more information about our programs, stop by the library or check out our website, Facebook or Twitter. SENIORS: Please check your school Gmail for information on college presentations being given in the Auditorium on PSAT day — Wednesday from 8:25-9:50 a.m. IUPUI and Southwestern Michigan College will be here to provide info on all that they have to offer. You must register in advance through any teacher or the Guidance Office. The deadline for registering is Tuesday at 1:00 p.m. Check it out today!! The first meeting for Stay In Bounds Ambassadors is today during the 2nd session of SRT. All returning ambassadors must attend and new ambassadors should receive a personal invitation based on recommendations. Any Junior student-athletes not recommended but still interested should see Mr. Kissinger on lunch duty today. The boys varsity soccer team ended its season on a loss to Elkhart Memorial. Goshen had one shot on goal and Memorial had two on goal. The boys tennis captured their first regional title since 1998 with a 3-2 win over Dekalb. Evan Beck got the first point at 2 singles with a 6-3, 6-3 victory. 1 Doubles scored next 7-5, 6-1. The match was decided in a 3rd set in the last match on. Hugh Birky recovered from a 1-6, 0-3 start to win 6-2 in the 3rd set and clinch the championship. They compete in the Semi-State match at 12:00 p.m. on Saturday at Homestead High School in Fort Wayne. The boys freshman football team will play at Northridge at 6:00 p.m. Go Skins! Goshen High School parent teacher conferences are scheduled for Thursday, October 8th. Students: Please have your computers tomorrow. You will be voting on the names submitted for the new mascot during the 2nd block. Lost & Found: If you have misplaced something please consider checking in the lost and found located at the Welcome Center. These items are piling up quickly! If you’ve lost a phone, jewelry or glasses please see Mrs. Stealy in the main office. Honey’s Supports Goshen High School! Please visit Honey’s on Wednesday, October 14th. Honey’s will donate 20% of your purchase to GHS when you present a coupon at check out. Coupons are located in the main office and in Guidance. IUSB will be here on Tuesday, October 13th for an on-site admissions visit. Your application fee will be waved, you may qualify for a $500 scholarship and you will receive an admissions decision on the spot. Please sign up in the guidance office. Congratulations to the Crimson Marching Band for winning Class A and capturing all caption awards (best visual, best music, best general effect) and Grand Champion of the Plymouth Harvest Festival of Bands! There will be a call out meeting on Tuesday, October 13th for anyone (including GMEN) that is interested in winter cheerleading (basketball season) during the 2nd session of SRT on the upper deck in the main gym. If you are unable to attend the meeting please contact Coach Sloan. There will be a meeting next Tuesday, October 13th during the 2nd session of SRT for all students interested in the marine biology trip this coming spring break. The meeting will be held in room 3050. If you have an interest please plan to attend this meeting. The boys tennis team advanced to the Regional finals with a 5-0 win over West Noble. No position dropped a set. The girls JV volleyball team defeated Bethany 2-0. The girls varsity volleyball team defeated Bethany 3-2. The boys varsity tennis team beat West Noble 5-0 and plays Dekalb tonight at 5:00 p.m. for the Regional championship. We still have some seats available on the bus for any JV players that want to come watch, so just let Coach Love know if you want to go. It would be great to have a huge crowd there! The varsity girls soccer season came to a close last night with a tough 1-0 loss to Northridge in the first round of sectionals at Concord. Senior Alyssa Hershberger finished out her career at GHS with another strong performance securing 11 saves for the Lady Redskins. Goshen says goodbye to seniors Alyssa Hershberger, Xenia Isaula and Catherine Loera. The girls final team record stand at 8-6-3. Thanks to everyone who came out and support the girls this year! The boys varsity soccer team will compete in Sectional Semifinals vs. Memorial at Elkhart Central at 5:00 p.m. The boys varsity tennis team will compete in Regionals vs. Dekalb at 5:00 p.m. at Concord. The GHS Fall play (Anne of Green Gables) will be presented at the Downtown Goshen Theatre. Show times are: October 9th at 7:30 p.m. and October 10th at 2:00 p.m. The cost is $5 for students and $7 for non-students. Today, the volleyball team will host Bethany Christian in its annual Breast Cancer Awareness game. The JV game begins at 5:30 p.m. and the varsity will follow. Please show up to support the team and this great cause! In addition, students with their ID’s in attendance will get 2 free slices of pizza between game 1 and game 2 of the varsity contest. Thanks for all your support and use the money you would have spent on pizza to donate to a great cause! The girls C volleyball team lost to Mishawaka 25-18 and to Concord 25-22. The boys varsity tennis team will compete in Regionals at 5:00 p.m. at Concord. The girls JV and varsity volleyball teams will host Bethany. JV plays at 5:30 p.m., followed by varsity at 7:00 p.m. The girls varsity soccer team will play at Concord in Sectionals-Round 1 vs. Northridge at 6:00 p.m. The Ultimate Frisbee Club is hosting a fundraiser at Hacienda TODAY. For more information please see any club member, Mr. Snyder or Lucas Kauffman. Tomorrow, the volleyball team will host Bethany Christian in its annual Breast Cancer Awareness game. The JV game begins at 5:30 p.m. and the varsity will follow. Please show up to support the team and this great cause! In addition, students with their ID’s in attendance will get 2 free slices of pizza between game 1 and game 2 of the varsity contest. Thanks for all your support and use the money you would have spent on pizza to donate to a great cause! Key Club members: The Fall Rally and Lock-In is this Saturday, October 10th at 7:00 p.m. The cost is $10 at the door, and you must register online before Saturday. Email Mrs. Dillman if you have any questions. We are happy to announce that the 2015 Goshen boys tennis team are the winners of the Goshen Sectional! This means our season is still alive. We next play West Noble at Concord at 5:00 p.m. tomorrow, while DeKalb plays Northridge (also at Concord). The top 10 guys will practice today after school as usual, and practice is optional for everyone else. It’s been great how many guys have been at the practices, and also coming to the matches to support the varsity! Varsity and JV soccer players: Please remember to turn in your fund raising money and order forms TODAY. If you have any questions see coach V after school out at the soccer field. The boys tennis team won their first Sectional title since 2002 with a 3-2 win over Jimtown. Hugh Birky led the way with a 6-0, 6-0 win at 3 singles, quickly followed by Evan Beck at 2 Singles. The 1 doubles team of Luke Rush and Logan Troyer capped it off. The boys varsity football team lost to the Northridge Raiders 27-20. The boys JV football team lost to the Northridge Raiders 13-0. The girls varsity volleyball team lost to South Bend St. Joe 2-0, lost to Mishawaka Marian 2-1, defeated Triton 2-0 and defeated Andrean 2-0. The girls JV volleyball team lost to Andrean 2-0, defeated Triton 2-0, New Prairie 2-1 and Michigan City 2-0. The boys cross country team finished 3rd at the NLC conference meet. Juan Perez paced the Goshen Harriers by finishing 5th. He was followed by Jason Barahona 9th, Felix Perez Diener 19th, Zach Oyer 24th, Erik Villegas 32nd, Irving Suarez 35th and Angel Arrelo 37th. The girls cross country team took 4th place at the NLC Conference meet. Ariana Perez Diener paced the lady harriers finishing 13th followed by Nora Rangel 21st, Annelise Wiebe 26th, Kirsten Graves 29th, Paola Rangel 39th, Montse Reyes 47th and Brandi Smith 49th. The girls freshman volleyball team will compete against Concord and Mishawaka at 5:00 p.m. at Concord. Good luck ladies! 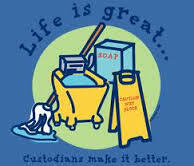 Today is Custodial Appreciation Day. If you see any of our custodians please make sure to thank them for the hard work they do here at GHS! Line 4 in the cafeteria is now cashless. The ONLY place you will be able to use cash will be the snack room. You can deposit money during breakfast in the cafeteria or anytime online at myschoolbucks.com. Any student interested in joining Key Club should turn in a completed application and membership fee to Mrs. Haney in the Bookkeeper’s Office. This applies to all NEW and RENEWING club members. The deadline is TODAY. Email Mrs. Dillman if you have any questions. Do your parents speak Spanish? Do you like to eat pizza? Tonight, from 5-7:30 p.m. we are going to have a Family Night in Spanish in the media center at GHS. Come and join our group of parents and students to eat pizza while you learn more about the necessary steps to pursue a college education. All the information will be provided in Spanish. The Interra Redskin Branch will be closed today. Today’s football theme is WHITE OUT! Support the football team at school and at the game by wearing white shirts, white pants, white hoodies – anything white, as long as it’s school appropriate! The boys tennis team advanced to the Sectional Finals against Jimtown with a 5-0 win over Northwood. No player lost more than three games. The girls varsity volleyball team defeated Plymouth 3-2. The girls soccer team finished their regular season last night with a 2-0 victory at West Noble. Hannah Kurtz and Kassandra Rodriguez scored for the Redskins. Goshen finishes the year 8-5-3. The girls now meet Northridge next Tuesday in the first round of sectionals at Concord. The game starts at 6:00 p.m. Come out and support the girls in what promises to be a great game! The girls freshman volleyball team lost to Plymouth 0-2 and Elkhart Memorial 0-2. The boys varsity soccer team ended their regular season with a victory over LaPorte, winning 3-1. LaPorte scored first about half way thru the first half. Goshen scored a few minutes later to tie it before the half. Goshen then scored twice in the second half. Goal scorers for Goshen were Alvaro Romo, Marcos Hernandez and Aaron Urzua. Assists for Goshen were Lucas Bontreger. Goshen had ten shots on goal and Laporte had two. Goshen had ten corners and Laporte had one. The boys JV soccer team defeated Laporte 7-1. Goal scorers for Goshen were Ciro Agular, Junior Argueta, Saulo Luna (2), Manny Castillo and Efren Ortega (2). Assists for Goshen were Diego Lorea (2), Ricardo Vargez and Ciro Agular. The boys varsity tennis team will host sectional finals at 4:30 p.m. The boys varsity football team will play at Northridge at 7:00 p.m. The girls JV and varsity volleyball teams will play in the Dunes Tournament starting at 9:00 a.m. central time. The girls JV soccer team will compete in the Warsaw Invitational at 9:00 a.m. The boys/girls JV and varsity cross country teams will compete at Concord for the NLC Championship at 9:00 a.m.
From now until October 4 at 3:00 PM submission of mascot names ideas can be made to mascot@students.goshenschools.org. 10/6: The Mascot Steering Committee will screen submissions and reduce the number of names to approximately 20. 10/8: GMS and GHS students will vote to narrow the list to approximately 5-7 names. 10-9: Finalists will be announced. 10/9-10/12: Additional artwork/logos for the remaining names may be submitted. 10/12: The Logistics Sub Committee will review logos and will recommend 1-3 logos with each mascot name finalist. 10/14: The mascot logo finalists will be sent to professionals for final art work.